Daurala Organics Limited, a chemical producer in Daurala, India, has two aeration tanks that treat flows of 1800 m3/d and 980 m3/d from the manufacturing of chemicals like Benzaldehyde and Sodium Sulfate. 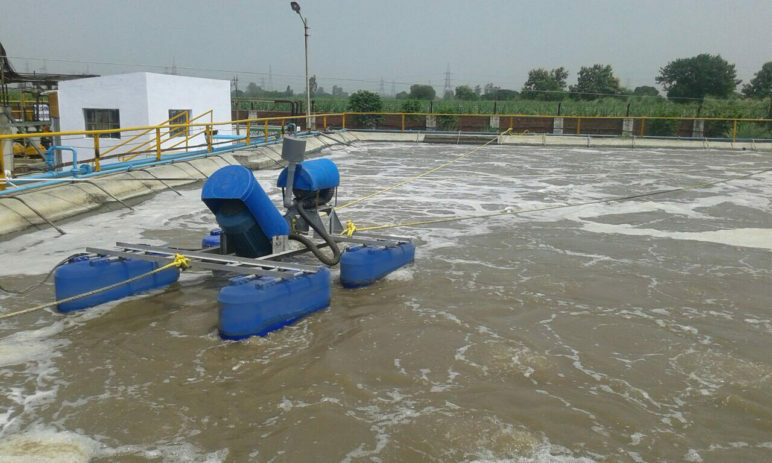 Daurala initially installed diffused aeration in their activated sludge basin. Overtime, they found the diffused air system was fouling and clogging, reducing efficiency in the plant. Daurala also required equipment that needed little maintenance and no loss of efficiency overtime from the chemical environment, so they could continue producing and treating the chemical wastewater. Daurala Organics partnered with Eurotek Environmental PVT. LTD. to design a solution that met their specific needs. In order to reduce fouling and clogging in the diffused air system and improve overall treatment efficiency, two Aire-O2 Triton® TR Series aerators/mixers were placed in each tank. With the Aire-O2 Tritons installed at the surface and the diffuser system at the bottom of the tanks, Daurala is seeing improved effluent quality. They are also seeing significant resource savings; as the Aire-O2 Tritons are durable in this chemical environment, require little maintenance, and downtime is no longer a concern. Questions on how we can help solve challenges you’re facing with your diffused aeration system? Contact us at +1-952-448-6789 for more information. Together, we can create innovative solutions for your wastewater challenges. Download the full Case Study or learn more about combining surface and diffused aeration systems.